Fact: North America is the literal birthplace of the wild horse. The magic of the horse originated on this land, then culminated globally and marked a turning point in the history of mankind. No other animal has had such influence and impact on humankind's development. To the wild horse, to the tamed horse, we owe immense gratitude and respect, for the horse gave two-leggeds a massive advantage and was instrumental in our development and our survival. Humankind will forever owe a great debt to the horse. In our evolution, it is historic fact that wild horses originated and fully developed on the North American continent. It is fortunate for man that some of those wild horses drifted across the Bering Land Bridge to Eurasia because those remaining on the northern continent were subject to a big die-off 10,000 years ago; as is the case for many species throughout time for various reasons. While many, many moons ago there existed a contiguous land mass which could be walked, the melting of the ice age gave way to rising waters which eventually divided continents by surrounding major land masses with oceans. This, of course, isolated pockets of humanity and life forms, including horses, until two-legged travel by water evolved. Recorded history tells us that around 4000 BC man's interactive relation with the horse was put in motion. Eurasians learned to tame and work with descendants of horses that had traveled by land from their birthplace in North America. This unleashed endless possibilities and ultimately led to the building of societies and empires. With the horse came power, strength, travel, and speed. It was not until Columbus crossed the Atlantic on his second voyage to North America that he brought horses along with his many men to the shores of this continent. This game changer marked the horse's literal return home. This was the first time since the big die-off on the northern continent that the horse was finally back on its home turf - a monumental event which required a boat for transport. Thanks to our documented history, we are able to know that wild horses are not feral, for all bloodlines always lead back to their native birthplace. The wild horse originated and fully developed right here on this land throughout the west and then migrated to what later became other continents. Let us recognize and nurture this unique legacy, for there is no other place on Earth like this. Let us celebrate our native treasure. 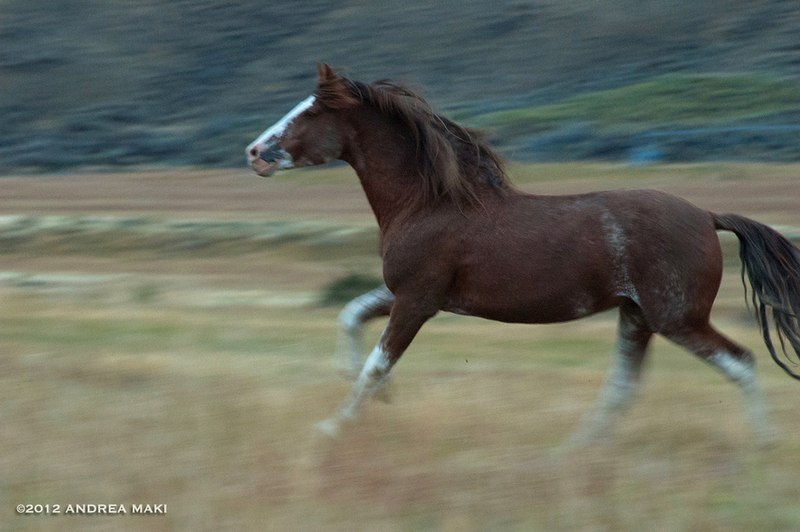 May we beam with pride and act with deep appreciation, compassion, and respect for our native wild horses. This is a legacy to nurture, honor, understand and secure for future generations. Wild Love is lasting and forever. THE HAGERMAN HORSE OF IDAHO - The Hagerman Horse (Equus simplicidens) was a North American species of equid from the Pliocene and Pleistocene periods, first appearing around 3.5 million years ago, and the Hagerman fossils represent the oldest widely-accepted remains of the genus Equus. An average Hagerman Horse was about the size of an Arabian Horse and probably lived in grasslands and floodplains, which is what Hagerman was like 3 million years ago. Native North American horses went extinct approximately 10,000 years ago, as did many other large-bodied species of the period. It is one of the oldest horses of genus Equus and is recognized as the State Fossil of Idaho. Cattle rancher, Elmer Cook, discovered fossil bones on this land in Hagerman, Idaho in 1928 and showed them to Dr. H.T. Stearns of the U.S. Geological Survey, who in turn passed them to Dr. James W. Gidley at the Smithsonian Institution. The bones were identified as belonging to an extinct horse, hence the site became known as the Hagerman Horse Quarry. Three tons of excavated specimens were sent to the Smithsonian in Washington, D.C., producing twenty complete skeletons, more than 100 skulls, and forty-eight lower jaws along with numerous isolated bones. Paleontologists believe that an entire herd of these animals were probably swept away and drowned by flood waters, ending up buried and fossilized in the soft sands of this river bottom. 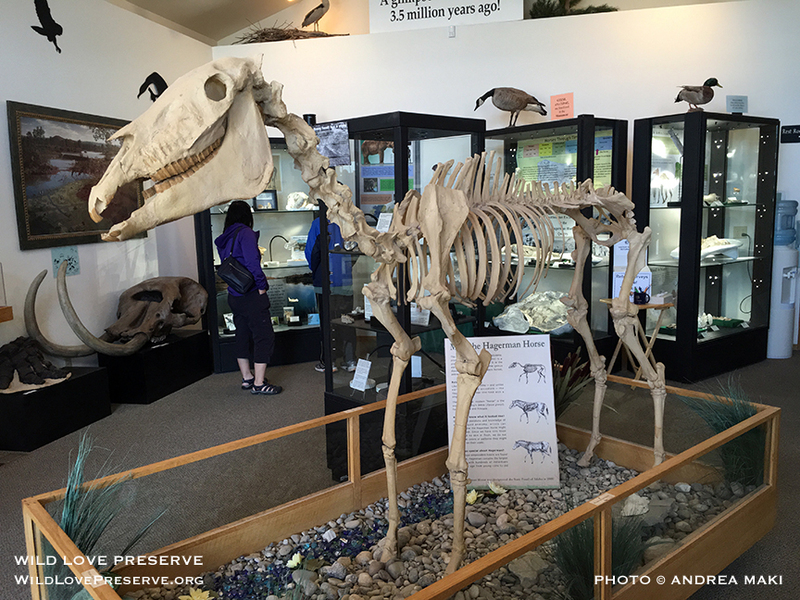 Visit the Hagerman Fossil Beds National Museum in Hagerman, Idaho to experience and learn more about this spectacular and unique history in person. By Science and Research Authors: Jay F. Kirkpatrick, Ph.D. and Patricia M. Fazio, Ph.D.